Orders for the 2000-PD Mint Sets were limited to 1.5 million sets - a goal that came very close to being reached. 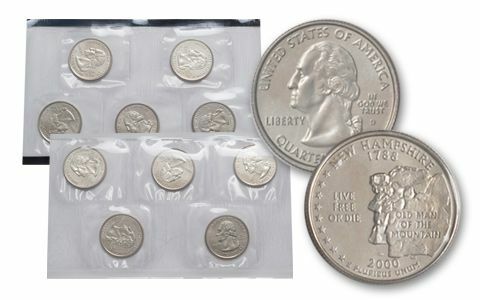 About the sets: The coins in the 2000-PD Mint Sets were Uncirculated pieces pulled from regular production runs, thus the quality of the individual coins varies widely from set to set, and even within a set. One example of each of the following Quarters from the Philadelphia and Denver Mints: Massachusetts Quarter (Copper-Nickel Clad), Maryland Quarter (Copper-Nickel Clad), South Carolina Quarter (Copper-Nickel Clad), New Hampshire Quarter (Copper-Nickel Clad), and Virginia Quarter (Copper-Nickel Clad). About the sets: Beware: the full 2000-PD Mint Sets contain 18 coins. Because the P- and D-Mint coins were packaged separately, they are sometimes sold separately. While it may seem obvious that each envelope is only half of the set, many new collectors have purchased single envelopes at the retail price for a full set! Original packaging: The 2000-PD Mint Set consisted of two different sets in two envelopes. One envelope contains coins from the Philadelphia Mint, the second contains coins from the Denver Mint. 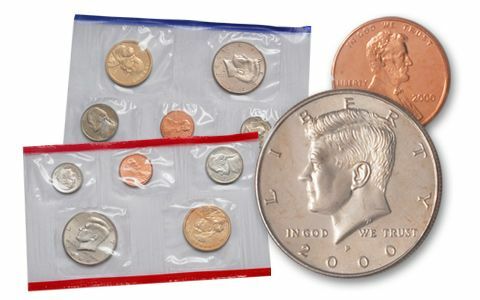 Each envelope contains two Mylar® packages, the first containing the Cent, Nickel, Dime, Half Dollar, and Dollar. 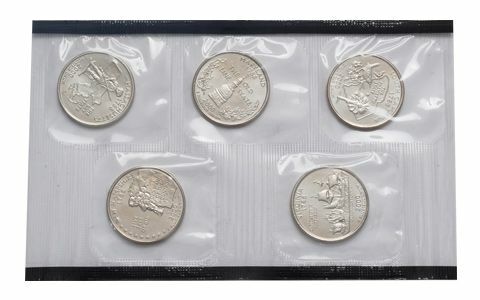 The second contains the following five 2001 Quarters from the 50 State Quarters® program: Massachusetts, Maryland, South Carolina, New Hampshire, and Virginia. 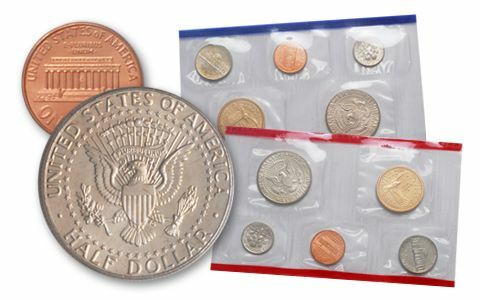 The pack containing the D-Mint coins was edged in red, the pack containing the D-Mint Quarters was edged in black, the pack containing the P-Mint coins was edged in blue, and the pack containing the P-Mint Quarters was edged in white. 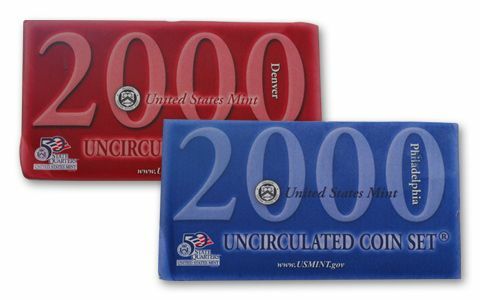 The two P-Mint packs were placed in a blue envelope; the D-Mint packs in a red envelope. George Bush edged out Al Gore in the Presidential election; Gore won the popular vote, but Bush won the critical Electoral College vote. Richard Hatch won the first television Survivor contest. Mexicans elected former Coca-Cola executive, Vicente Fox, as their President. Terrorists crippled the U.S. naval destroyer, Cole, with a massive explosion while it was docked in Yemen. The Presidents of North and South Korea signed a peace accord.